There is nothing like the smell of a new hard drive in the morning.... errr scratch that. New hard drives can bring on an overall increase in system performance, a gigantic leap in storage capability, and naturally, an urge to improve the size of your person MP3 collection. If you're upgrading from an older hard drive operating at 5400RPM to one with a speed of 7200RPM, the benefits of faster access times will be immediately evident. 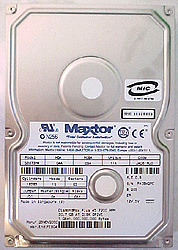 Maxtor have long been on the hard drive scene manufacturing very good quality drives (from our past experience we have yet to have any problems with them). Their drives tend to offer a pretty good bang for the buck, and are generally fairly quiet when operating (around 3.3 bel in idle). This retail boxed hard drive comes with the following accessories, making it a very useful purchase for those who are traditionally familiar with buying OEM drives (ie. just the hard drive). Included are the MaxBlast installation software, 5.25" drive bay brackets, ATA100 cord, screws, and installations instructions. Looking closer at the drive you can see the standard shell Maxtor use for just about evey drive they manufacture. 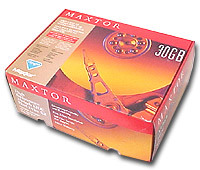 We have a few older Maxtor drives that have a bare aluminum base, whereas the newer models have black coatings. Not sure what the benefits are of this though. 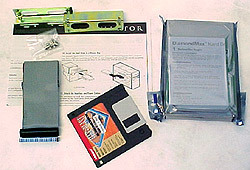 The drive uses 2MB of micron SDRAM for the disk cache. Operating at 7200RPM during heavy operation can get the temperature of this drive up fairly high, though not quite as hot as SCSI drives. 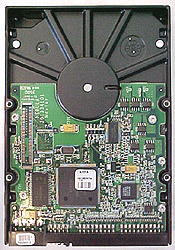 The DiamondMax Plus 45 series range in size upto 45GB, but this model (53073H4) sits comfortably at 30GB and has a total of two platters and two read/write heads. Read/Write heads ride on a very thin cushion of air above the surface of the platter, as it rotates at a 7200RPM. 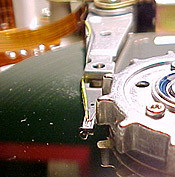 The picture on the left is from an older disassembled Quantum drive.